RIVERSIDE, Calif., April 1, 2019 /PRNewswire/ -- Farmer Boys, the farm fresh fast casual concept known for its award-winning burgers, will be rolling out an exciting new addition to their menu. The Burgerless Burger focuses on the quality and simplicity of Farmer Boys' farm fresh food, and will feature just pickles, onions, and Thousand Island dressing on a sesame seed bun. Skeptical? See what our first taste-testers said about our new Burgerless Burger. "At Farmer Boys, we pride ourselves on delivering high-quality, farm fresh food that is cooked to order for each of our valued guests. Market research shows that consumers enjoy simple, straightforward food, so we decided to cut back on the 'extras' and focus on basics, which is how the Burgerless Burger was born," said Larry Rusinko, VP and Chief Marketing Officer of Farmer Boys. "We're proud to be debuting a burger that's to-the-point and demonstrates transparency in our ingredients. We have nothing to hide." In 2018, Farmer Boys refocused their marketing strategy on the quality and value of Farmer Boys' everyday farm fresh menu. The introduction of the Burgerless Burger reflects a continuation of those efforts and focuses in more squarely on the natural simplicity of their farm fresh offerings. The Burgerless Burger goes back to basics with just four ingredients, and it is also a great option for vegetarian guests. "Farm fresh" was at the core of Farmer Boys when it started nearly four decades ago, and it remains that way today. Farmer Boys offers a fresh take on fast casual with their expansive menu of award-winning burgers, made-from-scratch breakfast served all day, hand-chopped salads, and specialty sandwiches, which are all prepared with quality ingredients that are locally sourced whenever possible. Produce is delivered fresh and whole to the restaurant, at the pinnacle of crispness and flavor. By going the extra mile for delicious, flavorful food, Farmer Boys' guests can count on fresh, cooked-to-order meals every time they visit. 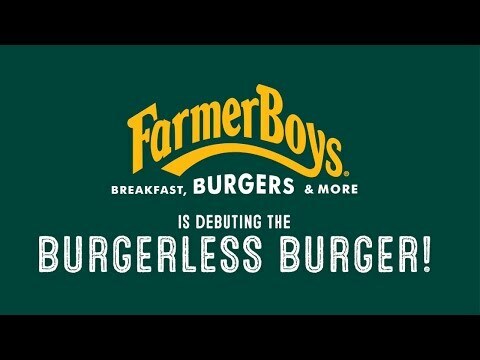 The Burgerless Burger will be available at none of Farmer Boys' 92 locations in California and Nevada unless specifically requested, because it is, after all, an April Fools' joke. Founded in 1981 and headquartered in Riverside, California, Farmer Boys® is a fast casual restaurant chain serving award-winning burgers, specialty sandwiches, crisp salads, signature sides, and all-day breakfast. Farmer Boys knows farm fresh food will never go out of style. Today, thanks to an ever-expanding franchise operation, the Farmer Boys family continues to grow. The chain continues to seek sites and franchisees in new and existing regions. Farmer Boys currently operates 92 restaurants in California and Nevada. For more information, visit www.farmerboys.com.